One of the most overlooked tasks when administering a Local Assistance project is the reevaluation of an approved NEPA document or decision. It may sound like yet another challenge to delivering a federal-aid project, but the NEPA reevaluation process can be a simple step in ensuring that your local agency is in compliance and ready for any potential audits. What is a NEPA Reevaluation? Before discussing reevaluations further, it’s important to know what they are. 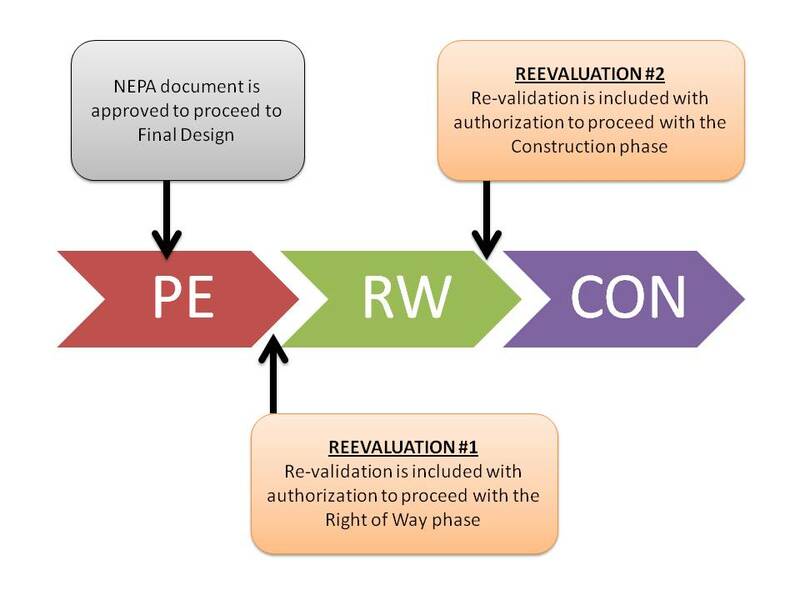 A reevaluation is the process of determining whether or not the NEPA decision made for a project remains valid. For Local Assistance projects, the process is documented with LAPM Exhibit 6-G: NEPA/CEAQ Re-validation Form1. The term “Reevaluation” refers to the process, while a “Re-validation” refers to the form. Why Reevaluate a NEPA Document? The easy answer would be to say, as with most tasks we encounter with federal-aid projects, it’s required by FHWA regulations2. More importantly, however, a NEPA document is based on the scope of a project at the time it’s approved. Various factors and circumstances may change that scope throughout the development of the project. Reevaluations are in place at key points to check for those possible changes and make adjustments to the NEPA conclusion if it’s no longer accurate. Following the approval of the NEPA document, a reevaluation is required prior to the request of any major FHWA action (e.g. Right of Way, final design, etc.). The requirement is independent of the time that has elapsed since the approval or previous reevaluation. If there are any changes to the project scope or setting, environmental laws, regulations, or policies, or mitigation measures, a reevaluation will be required. It’s also time to think about a reevaluation if major steps to advance the project have not occurred within three years after approval of the final EIS or supplemental EIS. 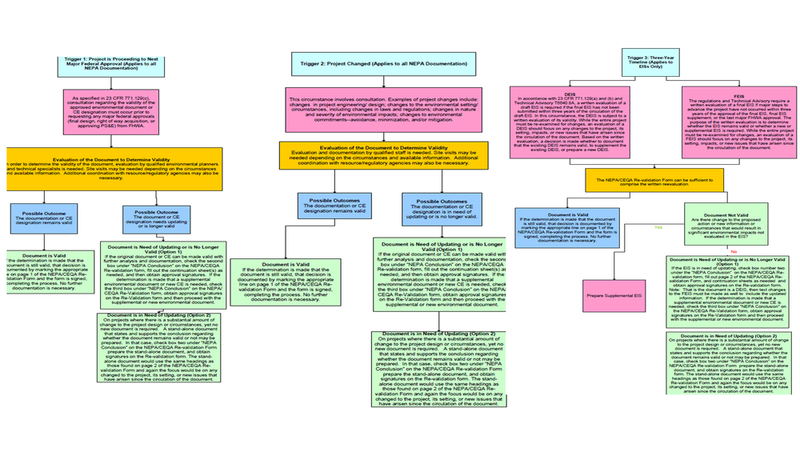 A helpful resource for understanding the three triggers is the Reevaluation/Consultant Process Chart provided in Chapter 33 of the Standard Environmental Reference. Once any of the three situations described above are triggered, your DLAE should be contacted to begin coordinating a reevaluation of the NEPA document. Unlike the use of a Preliminary Environmental Study (PES) Form to get the NEPA process started, a formal method to initiate a reevaluation request does not currently exist. While a phone call may be acceptable, I recommend documenting (e.g. letter or email) the reevaluation request for your project files. Communicate any project changes that may have occurred since the NEPA document or previous reevaluation was last approved. Once the DLAE receives the request and information, the Environmental Coordinator will be engaged to prepare a Re-validation Form. For projects with minor environmental impacts and no changes since the last approval, a reevaluation typically takes no longer than a week4 to verify that the scope remains the same and that the NEPA document is still valid. For more complex and controversial projects, several weeks of additional analysis may be needed to arrive at the same determination. For situations where the NEPA document is no longer valid, a new NEPA document may be needed and will need to be considered for the project schedule. For a majority of Local Assistance projects, the reevaluation process is on the shorter end of the time range, but local agencies should be aware of the potential impacts to a project.